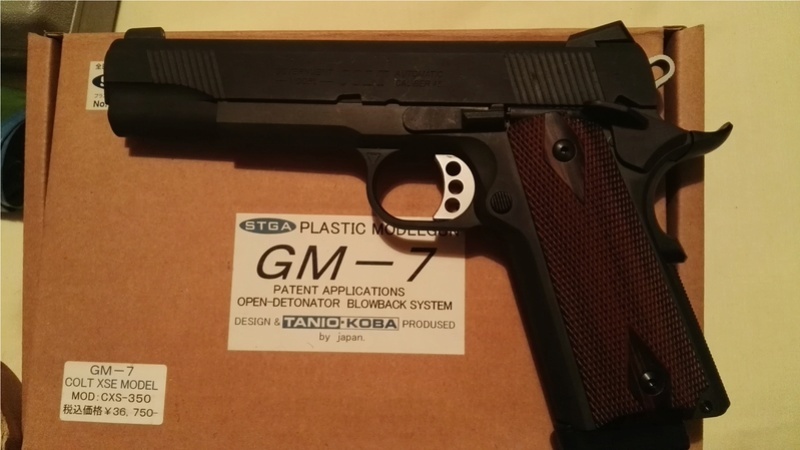 Tanio Koba GM7 Col 45 auto, The best handgun modelgun on the market, Fires great out of the box and (touch wood) never breaks. Tanio have brought out so many variations of this model and rounds to go with them its hard to keep up but any version of the gun although expensive is worth the cost. this is the fiber cartridge open round, first type he made. Thanks for posting up some more videos!!!!!!!!!!!!!!!!!!!! I agree with you on all counts about the Tanio Koba GM7/7.5. Absolutely terrific firing model and they seem to be very durable! I always try to get spares for my models in the event of breakage, but now I'm not sure what I'm going to do with all of my Tanio Koba spares!!!! I have found that after a lot of firing, the zinc ejector can mushroom a bit (but I don't use the nylon-type carts - I use metal ones). No worries, you can file it down and back into shape. Or, you can upgrade to the BWC chassis which uses a steel ejector and will never, ever wear out!!!! The only other thing I've broken on my GM7's is one time I broke an extractor claw. I'd been experimenting a lot with different carts and multiple cap loads, etc, etc, so I'm sure that had something to do with it. Keep the video camera rolling!!!!!!!!!!! Cheers mate, now i have time on my hands i am enjoying doing these vids and more to the point actually firing these guns. I would have a few more vids to put up but the usual modelgun problems happened as soon as the camera came out, plus my catch net broke so i can only do handguns at the moment, cannot have any rounds spraying over the place as the wife will kill me.